Here are two pieces of news about improvements to our riverside pathways, both giving Sandy Hillers more reasons to get out and about! On or about December 15, as you exit Strathcona Park in the south and continue along the river behind uOttawa’s football stadium, you will come to a City-constructed underpass. It will lead you under the refurbished LRT bridge (between the Lees and Hurdman stations) and hook you up to the path to Old Ottawa East. 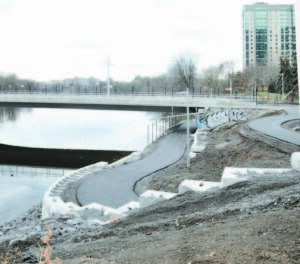 The developer of the Oblates lands a little further along this section of the Rideau River Western Pathway has also completed a public path between the river and the new construction. These new links mean we will be able to walk, run, bike, or ski all the way to Bank Street. Next summer it will be even easier to get to the Main Farmers’ Market; eventually we’ll be able to get to Lansdowne via the new pedestrian bridge being built over the Canal at Clegg Street. The second piece of news is more future oriented. Convened by Councillor Tobi Nussbaum, on Nov. 30 a small group of interested residents from Sandy Hill, Overbrook, Kingsview and Vanier met at the new Rideau Sports Centre (the RSC—formerly the Rideau Tennis Club) to hear from the founders of the SJAM Winter Trail along the Ottawa River. We were welcomed by Nicki Bridgland, CEO of the new RSC, whose vision for that centre includes supporting greater winter use of the Rideau River pathways. After learning about how the SJAM trail is managed and maintained, this group agreed to re-convene in January to investigate further how we can winter prep our pathway and facilitate greater use of it by walkers, runners, bikers, skiers and dogs. Interested? Contact Susan at susanonash@gmail.com.